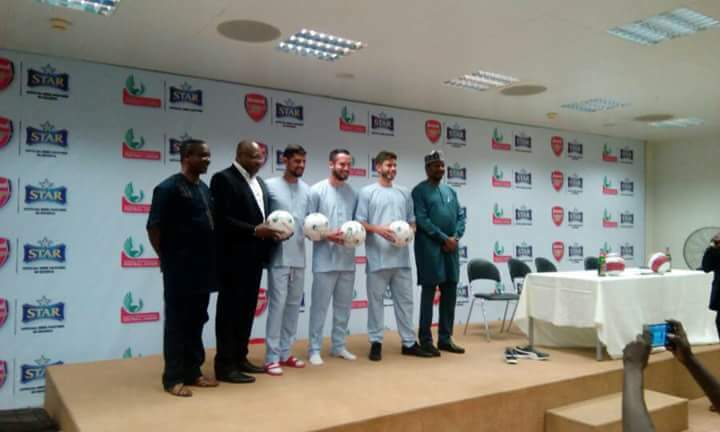 Instructors from English Premier League side, Arsenal, have concluded a three-day coaching clinic in Abuja. The coaching clinic, attended by over 30 coaches drawn from clubsides in the Nigerian league, was facilitated by Star Lager, a beer brand of Nigerian Breweries Plc. that has been supporting football development in Nigeria. It is part of the brand’s programme for the Nigerian league since signing a partnership in 2016 with Nigerian football authorities. The event, at the National Stadium, Abuja between Tuesday and Thursday, was designed to equip the local football coaches and technical supervisors with the tactical knowledge and skills needed to succeed in the game and improve the overall quality of Nigeria’s local football league. It featured theoretical and practical sessions led by Arsenal Soccer School coaches, Simon McManus and James Colinese. “We are very proud to have partnered with Arsenal and the NPFL on this coaching clinic,” Portfolio Manager, National Premium Lager Brands, Nigerian Breweries, Tokunbo Adodo, said after the exercise. “The coaching clinic is purely a technical football session to facilitate knowledge transfer between our foreign football club partners and our own football league to develop the quality of the local league. The Chairman of the League Management Company, Shehu Dikko, hailed the organisers of the event.